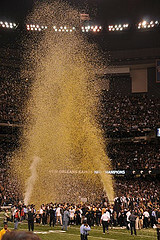 Flutter FETTI Confetti and Team Spirit Are Synonymous! 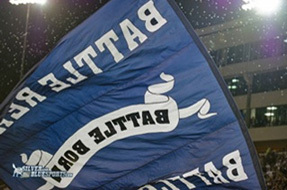 Flutter FETTI® sports party decoration products allow the most ardent fans to express their team spirit! 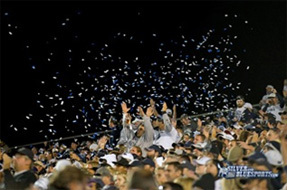 The same sports confetti products that have appeared at the Sugar Bowl, the Final Four, Super Bowl parties, and countless other high-profile sporting events also help get high school games cheering and pep rallies stomping. Show us your team colors, and we'll show you Flutter FETTI® your fans will love! 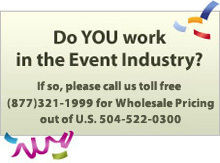 Let us know and Flutter FETTI® will send you spirit-boosting sports party decoration products to match. 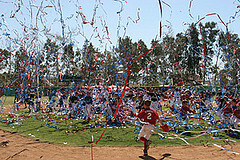 Swishers with colored pom-poms on the end will send out blooms of rectangular confetti or Metallic Streamers in your team's colors over you and your fellow fans, which will laugh with delight. Other Airless Launchers shoot forth gorgeous, long streamers specially designed not to travel onto the playing field. Halftime shows and special grand finales were made for Flutter FETTI®. For production companies seeking out a big effect for half-time shows and end-of-game finales, Flutter FETTI® offers professional-level sports confetti equipment. Our 9-Barrel PODs simulate the beauty of fireworks as they shoot out Metallic Streamers 85 feet into the air. Our X-6 Electric Launchers shoot 2" X 40' Tissue or Metallic Streamers 100' into the air. Our Continuous Flow Launchers swirl out one pound per second of Tissue and/or Metallic Flutter FETTI® or Tissue Corkscrews floating 10 stories high above the crowd. Ask us about the fantastic sports party decoration tricks we have up our sleeve. Amaze your fans. "Wow!" 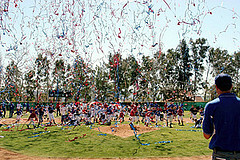 them with Flutter FETTI® sports confetti products!